GOBA is an association of autonomous Southern Baptist churches, that exists to more effectively fulfill the Great Commission as described in Matthew 28:18-20. MISSION: GOBA is Southern Baptist member churches working together to impact Central Florida and the world with the Good News of Jesus Christ. VISION: GOBA is a family of healthy growing churches loving, serving and reaching Central Florida and the world by developing and multiplying disciples, leaders, and churches. The Renovate Conference is developing a group of leaders committed to the work of church growth by revitalizing and renewing churches and church leaders. Key conversations regarding the need for church revitalization and how to incorporate church revitalization into the local church takes place during these crucial days of collaboration. 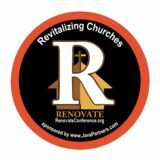 RENOVATE seeks to influence, train, and equip church revitalizers that multiply rapidly across the west with effective principles, ideas and solutions for the enhanced reproduction of church renewal in America. RENOVATE provides a national platform and delivery network for advocating the need of church revitalization. We seek to spotlight significant practitioners and leaders in church renewal. This multi-denominational conference is designed to connect, inspire, equip and challenge church revitalizers. ReproducingChurches.com exists - to be a catalyst for collaboration among local churches that share a passion for togetherness and sentness for the sake of the Gospel of Jesus and the reproduction of leaders who live sent daily in hopes that new expressions of the church will blossom. The purpose of G.O.A.L. is to develop leaders who reproduce leaders by encouraging development in the following areas: The leader’s personal life; The leader’s relational style; The leader’s ability to build an effective team, and The leader’s ability to lead organizationally. This is done through Greater Orlando Adventures in Leadership (GOAL), and through other appropriate seminar and conference venues. Our participants are asked to invest a minimum of two years of personal ministry development and growth in leadership development through the Greater Orlando Baptist Association. MAGAZINE RESOURCES BOOKS, STUDY COURSES, RESOURCES, & E-BOOKS! The Bi-monthly Resource Magazine from Central Florida for Pastors, Staff, and Church Leaders! Stock images from ISTOCK Photo or where otherwise noted. Dr. Tom Cheyney is the Executive Director of Missions for the Greater Orlando Baptist Association and serves as the Executive Editor for the Missions Rising Magazine. BOOKS, STUDY COURSES, RESOURCES, & E-BOOKS! Did you know that GOBA and Missions Rising offers pastors and church leaders an array of resources through our GOBA Bookstore? You can order books online, download free eBooks, find helpful tools for leading the local church, and discover just-in-time resources to help you as a pastor or lay leader. GOBA offers you study courses that can help you learn how to strengthen and grow your church! Visit: GOBA.org/resources for the most up to date set of resources designed to help the local church. 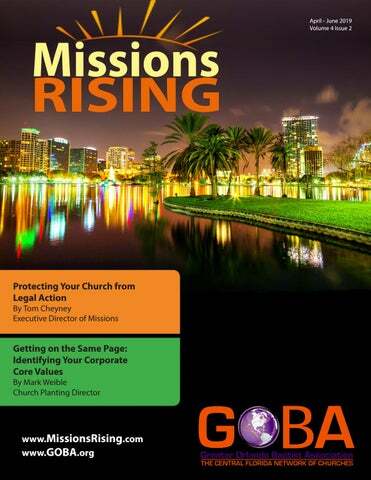 Go to MissionsRising.com for the latest news, podcasts, blogs, articles, just-in-time resources, and suggested books from the Greater Orlando Baptist Association and our content channel architects. to address the problem. Here within our association may I remind you that our churches must be a safe place for everyone who enters our doors. Furthermore, there must be regular and ongoing security for everybody while they are on your church campus. The Bible states: For it is time for judgment to begin with the family of God; and if it begins with us, what will the outcome be for those who do not obey the gospel of God?1 As you see, 1 Peter 4:17, clearly indicates that judgement begins at the house of God. Church Discipline is often talked about, but rarely implemented or done redemptively. It only takes one situation, alleged or real, to destroy the witness of the Church. The background of Malachi 3 is closer conceptually to Peter’s message in this respect, for the Lord will come to his temple and refine and purify his people, and then the offerings of his people will be acceptable (Mal 3:1–4).2 The judgment is the persecution which these saints were undergoing, a disciplinary judgment designed to purify their lives. The word “at” is literally “from.” That is, the starting place of the judgment is the Church, and from there as a starting point, the judgment goes on its way to the unsaved.3 Do you remember the sin of Achan in Joshua 7 which led to the defeat at Ai? The People of Israel violated the holy curse. Achan which was from the ancestry of Judah took some of the cursed things. GOD became angry with the People of Israel.4 The sin that Achan committed, its consequences for the nation, and the process of discovery and punishment of the sin are all related in this passage. The defeat at the hands of the men of Ai, is followed by victory over these same men later in chapter 8. The victory was made possible only because of the cleansing of the nation that had been defiled by Achan’s sin. Southern Baptist have been brought under the public microscope. How we deal with this will speak volumes to our churches, neighbors, and communities. What can be done? This is a whole Church issue and we must all be concerned with protecting the innocent. As pastors and leaders of the Church, we can put in place strict measures that will protect both children and adults from abusive behavior from anyone. Also, there needs to be policies in place to rightly report and restore the victims and those guilty of such behavior. Additionally, there must be in place a process to protect people from false accusations. I 1 The Holy Bible: New International Version (Grand Rapids, MI: Zondervan, 1984), 1 Peter 4:17. 2 Thomas R. Schreiner, 1, 2 Peter, Jude, vol. 37, The New American Commentary (Nashville: Broadman & Holman Publishers, 2003), 226. 3 Kenneth S. Wuest, Wuest’s Word Studies from the Greek New Testament: For the English Reader (Grand Rapids: Eerdmans, 1997), 1 Peter 4:17. 4 Eugene H. Peterson, The Message: The Bible in Contemporary Language (Colorado Springs, CO: NavPress, 2005), Joshua 7:1.
am sure this will be a significant topic at our annual meeting in Birmingham this June. We cannot begin the healing and restoration of victims or offenders until we recognize, repent, and admit that we have a problem. All throughout the Greater Orlando Baptist Association there are multitudes of godly, well respected, and upright pastors and leaders. We must pray for each other and hold one another accountable before God and men. If we do not heed the clarion call to do the right thing, how can we expect people to trust us or the Gospel we preach? How Do We Protect Our Churches from Legal Actions? As the lead pastor it is vital that you insure that your staff, professional clergy, ministry assistants, and volunteers will not hurt someone and make the church liable in the practice. Your church can take some steps to significantly increase the safety and responsibility of its employees and reduce the church’s exposure to legal liability. The risk of litigation should never impede the ministries of the church, but to ignore the existing dangers would be naive and equally wrong. Pastors, administrative staff, and church leaders must understand the risks and take appropriate steps in order to avoid them. You must educate both staff and volunteers. It is important that you recurrently discuss safety issues and concerns. Never assume that nothing will happen because things do happen unless you are watchful in protecting your church and flock. Help your team develop a sense of caution and discretion. There are some areas never to be overlooked. One is maintaining updated job descriptions, but we will address that at another time. I want us to consider church safety, high risk activities, both children and youth workers, and incident reports. Make sure your church develops and adopts a church safety policy. This policy should specifically state that all employees and volunteers are required to exercise caution at all times. Such a policy will help reinforce the regular safety education that you provide. Assess your property for potential accidents. Regularly take a careful walk through your church looking for potential hazards. View the church premises not from the perspective of a healthy adult, but from someone who is elderly, or visually impaired, or uses a walker or cane. Such inspections should be a regular part of the maintenance of the church. Remove or repair all potential physical hazards. If a hazard cannot be reasonably repaired or removed, then provide adequate warning. Request immediate feedback from your congregation whenever a dangerous condition is discovered. When you receive such a complaint, act quickly and fix the hazard immediately. viding safety for the children even when they think a new activity would be wonderful. It is wise to avoid sponsoring high risk activities. Here are some examples of high-risk activities taken from youth and children ministers. Some are, but not limited to: skate boarding, snow skiing, surfing, rock climbing, paint-ball, rappelling, and white-water rafting. If your church sponsors a high-risk activity, educate all participants and the parents of participating children about the associated risks. Obtain an “Assumption of Risk Waiver,” which should include: -The name of the activity -A description of the activity and the potential risks -A certification that a child participant is physically capable of engaging in the activity -A consent form to be signed by the participant or the parent or guardian of a participating young person -An acknowledgment that the person or parent has had the risks of the activity explained to them, understands the risks, and assumes the risk of injury from engaging in the activity -A medical consent form allowing treatment in the event of injury or illness. -Consult your church’s lawyer about the limits of these waivers. Do you want to see Godâ&#x20AC;&#x2122;s Word back in public schools? It already is! Visit KiDsBeachClub.org/what-we-do or call 817-510-5885 for more information. Your church should run official criminal checks on every man, woman, and teenager who works on staff, volunteers, or interacts with the kids in your children’s ministry. Keep the background checks on file and update them routinely. Have a protocol ready in case a background check comes back with information that may disqualify someone from helping with the children’s ministry. This will rarely happen, but having policies in place beforehand will protect you from legal action. In this protocol, write out a script template for those hard conversations. Include your church’s written children’s ministry policies and a list of non-negotiable disqualifiers for volunteers. Establish a process for vetting and training new children’s ministry hires and volunteers. Your staff members and volunteers need training in basic first aid, child protection practices, emergency preparedness, your church’s check-in/checkout protocols, any age-specific or ability-specific care, and the materials and methods for instruction being used. You need more than one or two adult volunteers for each Sunday school class and nursery room. Make sure you have an adequate ratio of adults to children in each age group. We all know things happen: Trusted volunteers may get sick or decide to take a spontaneous vacation on Friday night, leaving classrooms unattended for the weekend. If you have plenty of properly trained and vetted volunteers, you will have people to call on when they’re needed unexpectedly instead of wrangling the first willing (and untrained) person you find. rest of the kids as well, which leads to the next best practice. Have at least two designated volunteers whose only assignment is to go room-to-room and check on volunteers. These people can relieve adults who need to tend to emergencies, take a child to the restroom, find a parent, assist with a messy cleanup, or replenish resources. Dutch doors, which are cut in half and unlatch separately, are a huge help with both check-in and checkout time. Keep the bottom door latched and pass small children (walkers up to first grade) over the door to their guardians. This can prevent anarchy as children trample one another to get out the door and to their parents. It also keeps young children from running out the door before it’s time for them to go. Every child care room should be equipped with a firstaid kit, disinfectant, and children’s antihistamine (for emergency allergic reactions when no epinephrine injector is available). Volunteers need to know where fire extinguishers and exit plans are, have access to first aid, and have immediate access to a phone and water source. Also, keep a list of children with food allergies posted somewhere and send routine reminders to staff and volunteers of any medical conditions to be aware of. Have lists of parents’ and emergency phone numbers easily accessible. In addition to having all of these resources handy at every moment, make sure your volunteers are regularly trained on what to do in case of any type of emergency—where the exit plans are, how to handle a medical emergency, who knows CPR, whom to call in each situation (and in what order to call them), etc. important practice for churches with large children’s ministries. We never think people would try to take a child, but if someone wanted to, where would that person go? They would go where kids are accessible and parents are unsuspecting. This system also protects children who may have strict custody regulations. The matching sticker system requires adults to prove the child in question belongs with them. The rule is you can’t claim your kiddo if you don’t have the matching sticker. It is best to enforce this rule universally, even when you are very familiar with families. This way no one feels singled out and everyone is equally protected. Sexual abuse is easy to overlook and presents itself through peculiar behaviors. Require a training seminar for all staff (even non-children’s ministry staff ) and regular volunteers about how to spot physical and sexual abuse. Make sure your staff and volunteers know whom to go to if they suspect any child is suffering from physical or sexual abuse. There are many private agencies which can assist you and one I have used is Darkness to Light which offers resources, training seminars, and awareness certifications to prevent child sexual abuse. No matter the cost, if it spares one child from the pain of enduring abuse, the worth is invaluable. There may be no better way to show children the character of God than to see them and shelter them when no one else can or will. We can do that only if we know the signs of physical and sexual abuse. Children’s ministry staff and volunteers are an essential part of a healthy congregation. Having happy and safe children keeps parents engaged in the church. Use these best practices to help ensure your children’s ministry keeps all kids safe and is set up for long-term health and growth. Have an adequate number of adult supervisors for each activity. Possible child-adult ratios for church preschool Sunday School and off-campus youth activities: Babies Ratio: Children/Worker 2-1 Ones Ratio: Children/Worker 3-1 Twos Ratio: Children/Worker 3-1 Threes-Pre-K Ratio: Children/Worker 4-1 Kindergarten Ratio: Children/Worker 5-1 Youth Activity Ratio: Youth/Workers 8-1 Consult your church’s attorney for help in ratios and all aspects of the screening process, including the questions you ask, the forms you use, and the confidential records you maintain. ed, is considered illegal for mandated reporters and can result in legal action. Every church should have an established channel for reporting suspected child abuse to the appropriate authorities. If you are a children’s minister or pastor, and you do not know how to report abuse, please schedule a time in the next two weeks to do research or enroll in training. It is vital to know what to look for and how to respond when a child is being hurt. What a difference it makes when a church community is on the lookout for the welfare of its children. Immediately investigate and confront any inappropriate behavior. Take whatever corrective action is warranted. Report potential and actual violence or abuse. In situations in which you reasonably believe a crime of violence or sexual abuse will be committed, take immediate action to notify the appropriate authorities.5 If an abuse has been committed against a child, you will most likely be required under your state law to report it to local authorities. Even if your state does not have mandatory reporting laws, you should report such an incident anyway to protect the abused child from further harm and protect other potential victims. Here is a sample of an Incident Report that you can rework to fit your situation. It is a good form and has been used in many churches: YOUR CHURCH Reporting and Responding to Alleged Child Abuse or Neglect Reporting Policy: It is the policy of the YOUR CHURCH to report any incident of child abuse or neglect of any child to our local Law Enforcement & Child Protective Service Agency (Number for those are 911 & (407) 836-7600). This would include participants in temporary childcare programs. • YOUR CHURCH does not treat any instance frivolously. • We will notify certain employed team members / investigation parties right away to make sure allegations are not random gossip / hearsay. • All leaders / team members associated with YOUR CHURCH/ Student or Child Ministries will report any & all alleged abuse or treatment to the lead pastor in said ministry. This person will then take the necessary actions accordingly. • Any leader or team member involved in such acts will be temporarily relieved of their duties involving children until official investigation has been completed. • We will cooperate fully with law enforcement officials 5 The Childhelp National Child Abuse Hotline is staffed 24 hours a day, seven days a week, with professional crisis counselors who have access to a database of 55,000 emergency, social service, and support resources. All calls are anonymous. Contact the hotline at 1-800-4-A-CHILD (1-800-422-4453). Why Biblical DISC®? Biblical DISC® provides individuals a road map of their behavioral strengths. Knowing our unique behavioral style and strengths is key to healthy relationships and organizational success. The Biblical DISC® Assessment establishes a foundation for building the loving relationships that Jesus envisioned. Biblical DISC® Assessment: a personal and team assessment that combines 30 years of Biblical research with DISC, the leading personal assessment used by over 1 million people every year. when they are asked to step in. • The Lead Pastor or agent of said ministry area will inform victim and victim’s family of the steps that are being taken in this process, and continue to keep them advised of the status of the investigation. If child abuse is confirmed the acquisition of a lawyer will be suggested by the Lead Pastor of the students ministry. • In an instance where child abuse is confirmed, the organization will immediately dismiss the volunteer, leader, team member, and etc. from their position. Termination will be considered appropriate in the circumstances dealing with Children / Student Ministry. • In instances where evidence is inconclusive, YOUR CHURCH will take each instance case by case in accordance to various consultation and advice from certain credible areas with experience in such matters. • Such acts will not be commented on publically; however, as for serving with Children/ Students, their acts of abuse will rule them unable to do so both legally and effectively. Reporting Obligation: By law, YOUR CHURCH or its representative pastors are responsible in any situation where a child is believed to being physically abused, sexually abused, neglected or is dependent. We are required by law to report such acts to the already mentioned areas above. Reports Required: Any worker of the religious organization who has cause to believe that a child’s physical or emotional health or welfare has been or may be adversely affected by abuse or neglect shall report that belief according to the following procedure: • The worker shall report such belief to the religious leader, a member of the staff and/or leadership. • The religious leader or staff member will immediately report to one of the following: the local Child Abuse Hotline or any local law enforcement agency. • The religious leader or his agent will notify the parents of the child (unless the parent is the person responsible for the abuse or neglect). • The religious leader, or his agent, in consultation with the chairperson of the Personnel Committee will notify the appropriate legal counsel. • The religious leader, or his agent, will notify the organization’s insurance agent that an abuse report has been filed with the appropriate local or state agency. Incident Report: The person making a report should identify: • The name and address of the child. • The name and address of the person responsible for the care, custody, or welfare of the child. • Any other pertinent information concerning the alleged or suspected abuse or neglect. Dr. Tom Cheyney is the Executive Director of Missions for the Greater Orlando Baptist Association and serves as the Executive Editor for the Missions Rising Magazine. He is the Founder & Directional Leader of the Renovate National Church Revitalization Conference and provides various training events designed for the local church. MISSIONS RISING! 6 REMARKABLE TOOLS TO FORTIFY THE PASTOR WITHIN YOU. or are seeking a candidate. top planting groups in the nation. vidual coaching. You may inquire to the costs involved and the commitments, which need to made as to the duration of the coaching cohort. There is an 18-month initial commitment required to join the network and an additional 18 months might be granted for further coaching towards church revitalization and renewal. and as arranged annually across North America. These events train pastors, staff, and laity in the necessary skill sets for the revitalization and renewal of the local church. Anyone is welcome at these monthly events and we promote them a month in advance allowing those who want to fly in to do so. training designed for both laity and ministers alike. These monthly events are one day events laser focused towards a specific leadership issue. month locally and as arranged annually across North America. These events train church planters, church planting teams, and laity of the church plant in the necessary skill sets for the planting, reproducing, and multiplying of the local church. The local Central Florida events are offered for free while some of the national one-day events have a cost associated with the event. Your One Stop Shop for Church Revitalization and Renewal Resources! Checkout our lineup of resources that will help you revitalize your church. Identifying Your Corporate Core Values By Mark Weible The new pastor sat down with a small group of whom he had determined to be the most influential leaders of his church. He asked them questions about the church’s heyday – her glorious past, and her recent decline. During listening sessions like this one, he discovered that each person had a tendency to point to different success indicators in the past and that they had a hard time agreeing on mile posts for the future. He had his own ideas for the future, but he discovered that no one else shared his vision. He was not ready to lead them to the next level and they were not prepared to follow his leadership. Leading has more to do with learning than lurching. Most church revitalization leaders enter the life of a church after much of the story has already been written. Therefore, it is wise to learn the history of the church before leaning into the future. By asking different groups of people to describe the greatest successes and failures of the church, a church revitalizer can discern the church’s actual core values. Often, these are different that any stated core values. Core values are assumptions about how a church operates, what is important and how to measure success. Ken Blanchard describes core values as, “those intangibles that will guide your journey and govern how you want people to behave in your organization.”1 As individuals, we have our own set of values. Organizations 1Blanchard, Kenneth H., Phil Hodges, and Phyllis Hennecy Hendry. Lead like Jesus Revisited: Lessons from the Greatest Leadership Role Model of All Time. Nashville, TN: W Publishing Group, an Imprint of Thomas Nelson, 2016. P. 148.
have common values and communities often have shared values as well. Our values drive our behavior and if we seek to influence the behavior of others, it is important that we first understand what we value most. Then we must define the core values of the church, while keeping in mind the common values of the community as a whole. According to research conducted by Taylor Protocols2, all humans share at least four core values and four catalytic values to varying degrees. While we may hold to hundreds of other values, we can each identity two pairs of values that really motivate us and drive our behavior. The Core Values Index is a scientifically valid tool that can be used to help individuals identify their core values, help teams to see where their values are clustered and where they lack input, as well as help organizations and churches to identify their corporate core values. Also, when we understand the core values of the people in our neighborhoods and communities, we can more effectively communicate the gospel, make disciples, grow churches and multiply the kingdom of God. The four value pairs identified by Taylor are: 1. Power and Faith 2. Love and Truth 3. Wisdom and Compassion 4. Knowledge and Justice3 2 https://docs.wixstatic.com/ugd/7ada30_59ebd48e3ff94c63b24e44b631951c80.pdf	3 Taylor, L. and Taylor, L. (n.d.). The core values handbook. porate contributions. The CVI can also help people to understand their natural conflict strategy and the likely conflict strategies of others. Renovate is a now a provider of the Core Values Index and the Renovate team offers core values coaching to individuals, churches, and other organizations. You can request a free CVI sample or get the full report at www. CVI.report. You can request coaching by sending an email to Mark@CVI.report. Mark Weible serves as the Church Planting Director of the Greater Orlando Baptist Association and the strategic Director of the Renovate National Church Revitalization Conference. Mark has a wealth of experience as a church planter and local church coach. Mark is passionate about church multiplication, renewal, planting, and coaching. GOBA continues to discover, develop, and deploy church planters who have a passion to see new churches reaching communities for the Lord Jesus Christ. Reproducing Churches has been your go to partner since 2003 in the field of church planting and the sponsoring of churches. Besides conferences, workshops, and monthly equipping for the local church, we provide the Church Planters Top Performance Profile Assessment. The assessment provides a quick and easy way for prospective church planters to discover if they are better prepared to serve as a lead church planter or a church planting team member. The Church Planter Top Performer Profile Assessment is a Church Planting pre-assessment selection tool that is positioned at the very beginning of the Church Planter search process as an objective screening process to discover qualified ministry leaders who have the capacity to plant a local church. This CPTPPA is based on our top successful church planters from all across the nation and their performance. This will be utilized to qualify and to pre-select future top performers from incoming candidates for a specific local church and ministry. We have partnered with Exos Advisors to use their patent pending algorithms to find Core Values patterns in existing top performing church planters. This validates and proves that the resulting CPTPPA will consistently identify new future top performers in the field of church planting, while screening out a vast majority of future low performers. How this works: When a churchâ&#x20AC;&#x2122;s mission group is in the process of searching and considering the calling of a Church Planter to lead out in the creation of a new church, the prospective candidate is sent an email with a link to the CPTPPA. The CPTPPA is then completed by the candidate and their score is automatically received by GOBA and will be shared within seven days of completion with the candidate and the local church. The report will be compared to the Church Planter Top Performer Profile Assessment. Those candidates which assess as a â&#x20AC;&#x153;highâ&#x20AC;? potential for the successful planting of a healthy New Testament church are then recommended to local churches. The sponsoring church will still need to qualify the planter candidate in the areas of: character, doctrine, financial stability, and experience which is done on the local level. To find out more or to take the online assessment, go to www.PlanterAssessment.com. GOBA can received a 50% discount on the cost of the assessment with promo code TPP50. Across the globe, Jesus Film Project has brought millions face to face with the most powerful story in history. However, there are still billions unreached. It's time to reach them with the Gospel through strategies, tools, and partnerships like yours!